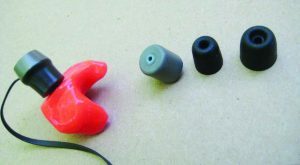 The author tried the three different ear tips on the right with the Razor XV unit but ended up with the custom molded ear piece from E.A.R. 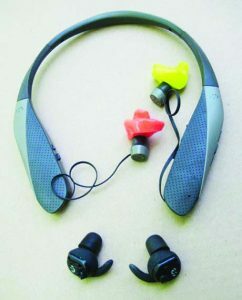 Some months back we received the new Walker’s Razor XV ear protectors for testing (gsmoutdoors.com/earbud-headsets). These patented hearing protectors feature a neck worn device with retractable ear buds. The behind the neck design is comfortable for all day wear. The patent-pending buds provide not only hearing protection but enhance one’s hearing as well. Without the bulk of traditional muffs, the Hi Gain Omni-directional microphones allow the shooter to hear conversations and range commands clearly while, at the same time, providing protection from the sounds of gunfire. These newest Razor-VXs also offer Bluetooth compatibility for streaming music or taking phone calls on the range. By the way, why one would want to take phone calls on the range is beyond the comprehension of this old shooter; modern we are not. The SILENCER ear buds with the different ear tips and Sure Lock sizing fins ensure a precise fit to the user’s ears. The Razor-XV set comes with an assortment of different sized foam tips for a custom ear fit. We however had a hard time getting a proper seal with the tips enclosed with the unit. As chance would have it, we later ran into a Walker’s representative at a Michigan Cabela’s store on a trip to the UP. After explaining our problem, this nice lady gave us a different pair of foam tips to try with the ear buds of the Razor-XV. These were some better but still not as effective as we thought they should be. 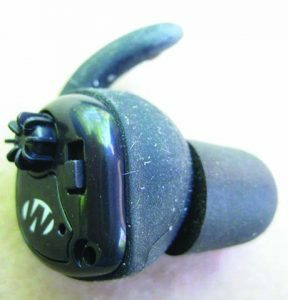 A close up of the SILENCER ear bud shows the on/off switch, volume control, Ear Tip and sizing fin. At an NRA annual meeting we ran into the folks from E.A.R. (earinc.com) and, as we had the Razor-XV unit with us in the truck, a plan was hatched. If you’ve been to any of the NRA conventions or the Harrisburg Sports Show you’ve probably seen the E.A.R. booth. These are the guys who make custom molded ear plugs on the spot while you wait. 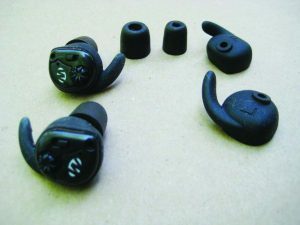 They do everything from basic plugs to electronically enhanced hearing protection as well as custom plugs for ear buds. We had them take molds of our ears and they took the Razor-XV unit back to Boulder. CO, with them. In about two weeks we received a package in the mail with the Razor-XV ear buds retrofitted with custom fit ear pieces; red for the right ear and yellow for the left. So fitted, the Razor-XV unit now has a perfect fit to our ears. The cost was $130 for the custom molded ear pieces. The behind-the-neck band of the Razor XV not only services the hearing protection mode of the ear pieces but also is Blue Tooth compatible. The SILENCER ear bud offer only amplification of normal sounds and SAC reduction. The Razor-XV unit is rechargeable via a wall plug USB adapter and has a battery life of over 10 hours from our experience. There is also an auto-shut-off feature after 4 to 6 hours and the unit will wake up again after any button is pressed. Usable not only on the firing range but also in the field for hearing enhancement while hunting, the Razor-XV from Walker’s is a truly low profile unit that offers great versatility in the ever-changing world of modern communication while at the same time protecting one’s hearing. MSRP is a reasonable $159.99. The E.A.R. custom molded ear piece offers a very precise seal. We have also been testing the brand-new Walker’s SILENCER in the ear hearing protectors. The right and left Ear Buds are very similar to conventional hearing aids and have omni-directional microphones and full range speakers. The sound delivered is clear and crisp and the volume is independently adjustable. 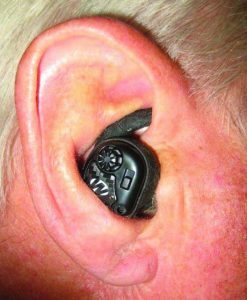 Sound Activated Compression technology of the unit protects hearing by shutting out loud noises. Noise reduction is rated to 25 decibels. Fitting takes a bit of fiddling around but with the three different sized foam ear tips and Sure-Lock sizing fins provided with the SILENCER we found that getting a solid fit and seal was easier than with the Razor-XV unit, at least as we first received the latter. The SILENCER unit runs for 80 hours on #10 batteries (the units take one each and 4 are provided). Power is controlled by a small on/off switch but there is no auto shut off feature so you have to remember to turn the things off. The SiLENCER ear bud is low profile with no external wires. After fitting the SILENCER units to our ears, we strolled down to the range for a bit of pistol shooting. The fit of the SILENCER units was comfortable in our ears and insertion and removal was trouble free. The SAC technology does indeed mitigate muzzle blast and we could hear the gurgling of the nearby creek, and other natural sounds, quite distinctly. 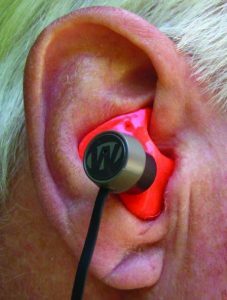 Priced at $229.95 we feel the SILENCER Ear Buds are a pretty good bargain, especially when compared to the cost of hearing aid units possessing the same or similar features. 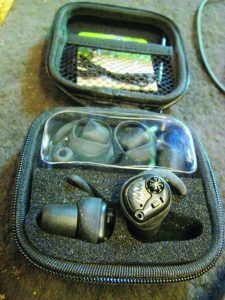 The SILENCER ear buds come in a self-contained case with three different sized ear tips and three Sure-Lock sizing fins. Also included is a cleaning tool and a lanyard. We plan on taking both the Razor-XV and Silencer Ear Buds on the summer varmint shooting trip. How they hold up in the field (and on the truck dash in the sun) as well as getting a real-world battery life test will tell the final tale in our book. So far, both of these new units from Walker’s seem to work as advertised. Much lower in profile that muffs, either the Razor-XV or the SILENCER will be much cooler to use in the heat of the dog towns and should be completely out of the way when rifle shooting. 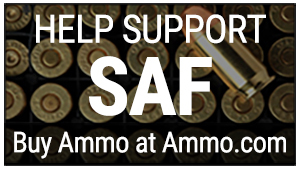 Good hearing protection just got a bit more convenient to use. Good Shooting.